Leider ist keine deutschsprachige Version dieser Seite verfügbar. Magnesium deficiency is abundant, but mostly unspecific, due to the general role of Magnesium inside and outside the cell. Hence its diagnostics is open to many errors. The first error in diagnostics is to not recognise relevant symptoms as part of a magnesium deficiency syndrome (MDS) [1,2]. The second error is to interpret symptoms that belong to the magnesium deficiency syndrome as irrelevant and belonging to the decline of somatic functions with age. Both errors were indicated in our contribution to the 9th International Magnesium Symposium, Vichy 2000. The third error will be considered in more detail below. 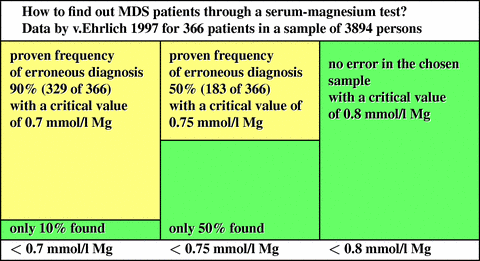 It occurs when the practitioner identified the symptoms of the patient as part of the magnesium deficiency syndrome, starts a test of the serum concentration of Mg, but misinterprets the result by using a misunderstood criterion. The fourth error belongs more to therapy than to diagnosis. When the practitioner has been convinced to start a magnesium therapy after an own successful diagnosis or through insistence of the patient, it is not sufficient to start the therapy with the often recommended dose of 300 mg per day. All experience of successful therapy indicates that 600 mg per day is the minimum necessary application. Magnesium is an essential element occurring naturally in the body and is not a foreign drug normally absent in the body. Thus its metabolism is regulated, and the immediate effect of supplemented Mg is moderate. Therefore, the therapy should not expect major effects within one week or two. the average value for the magnesium deficiency patient is not less than 0.75 mmol/l Mg, probably a bit higher. when the distribution is symmetric, a critical value of 0.8 mmol/l Mg misses about 10% of affected patients. The estimation of the mean value for the normomagnesiaemic persons without clinical symptoms varies about the value of 0.9 mmol/l Mg. When the distribution for the affected is Gaussian, a critical value of 0.9 mmol/l Mg misses only 1% of the affected. v.Ehrlich had diagnosed 366 (9,4%) patients among 3894 in total which had symptoms belonging to a clinically relevant magnesium deficiency syndrome (MDS) and showed less than 0.8 mmol/l Mg [3,4,5]. When patients with more than only 0,7 mmol/l Mg [9,10] would be considered as normomagnesiaemic, more than 329 magnesium-deficiency patients would be erroneously declared as normomagnesiaemic. In these cases (that cover 90% of the affected patients!) unfortunately, no magnesium therapy would be started. Taking 0,75 mmol/l Mg [6,7,8] as critical value, v.Ehrlich still had missed 183 (50%) of the affected patients. We conclude that 0,8 mmol/l Mg is the critical value to be applied, when not more than 10% of the affected patients shall be missed. When a therapy is started, it should not be reduced before the MDS patient reached the value of 0,9 mmol/l Mg. It is a famous error in statistics to use the confidence limits of the normal population as exclusion limits for the affected (see the diagram below). 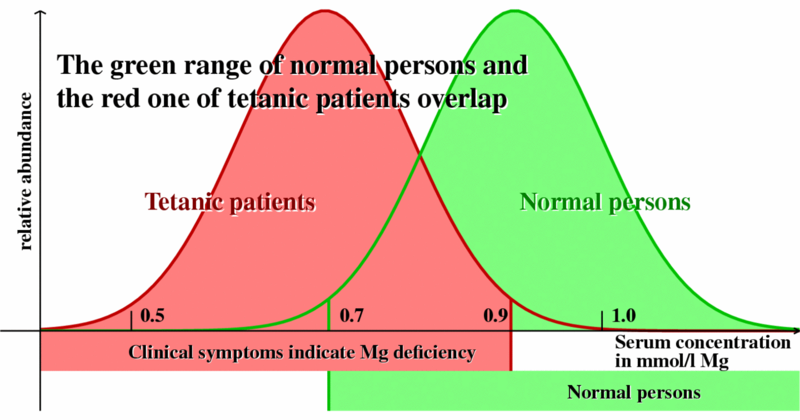 In any decision between two alternatives (here: normal person and patient) two distinct errors are present: First, a person without magnesium deficiency can erroneously be decided to have a deficiency (error of the first kind). Second, a patient with deficiency can erroneously be declared normal and remain undetected (error of the second kind). The decision procedure decides about the value of both errors, and can be chosen to fix one of the two. Usually (because it can be determined by calculation), the error of the first kind is chosen to be 0.05 or 0.01. However, the smaller the error of the first kind is chosen, the larger the error of the second kind will necessarily be . In most cases - and our case belongs to these - the error that implies the higher risk or the higher costs must be made small. In our case, this is the error of the second kind, i.e., the costs of the untreated illness. The decision through use of the serum concentration must respect the distribution of this value for affected patients, and must not use the distribution for normal persons. In 2000, we estimated the distribution of the serum value for affected patients much too conservative. As the data of v.Ehrlich show, the mean value of the left distribution is larger than 0.75 mmol/l Mg, and only 10% of the red area lie left to 0.7 mmol/l Mg. The distribution for the affected patients must be shifted to the right, but could be narrower. The exclusion of a MDS can be safely done only for critical values higher than 0.8 mmol/l Mg. It is our based on experience conviction that many patients with so-called exclusion diagnoses (as attention deficit hyperactivity disorder (ADHD) or chronic fatigue syndrome (CFS), for instance) would improve their symptoms through Magnesium therapy. Patients with certain exclusion diagnoses should be considered as potentially Mg-deficient. The same holds for patients with diagnoses of depression, epilepsia, diabetes mellitus, tremor, M. Parkinson, arrhythmias, circulatory disturbances (stroke, cardiac infarction, artheriosclerosis), hypertension, migraine, cluster headache, crampi, neuro-vegetative disorders, abdomial pain, osteoporosis, asthma, stress dependent disorders, tinnitus, ataxia, confusion, preeclampsia, weakness. These symptoms belong to the magnesium deficiency syndrome, too. 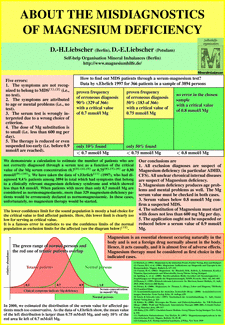 Symptoms belonging to the magnesium deficiency syndrome require to determine the Mg serum value. In the cases with Mg serum values lower than 0,9 mmol/l Mg it is recommended and for values lower than 0,8 mmol/l Mg it is necessary to start a Magnesium substitution therapy. We recommend to generally apply a magnesium serum value of 0,9 mmol/l Mg as the lower reference limit, when corresponding symptoms or diseases stated. In this case, Magnesium has to be used as a first choice therapy. When symptoms of the MDS are found, patients with serum values of less than 0.8 mmol/l mg, or better 0.9 mmol/l Mg, ought not be erroneously declared normomagnesiaemic. When magnesium substitution is started, the minimum dose to be applied is 600 mg Mg per day. The therapy should proceed more than one month, and then continue with a dose that holds the serum value not lower than 0,9 mmol/l Mg.
Magnesium is an essential element occurring naturally in the body and is not a foreign drug normally absent in the body. Hence, it acts causally, and it is almost free of adverse effects. Magnesium therapy must be considered as first choice in the indicated cases. All first-choice use of drugs runs instead into the danger of poisoning the patient and pushing him in a hopeless situation in which the wrong diagnosis always confirms itself. This is to be accounted for in particular in diagnoses of symptoms that are considered to be of mental origin.